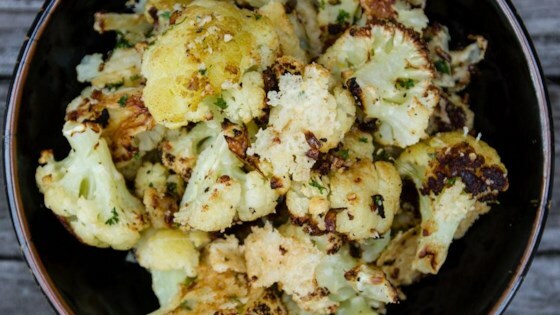 "Wonderful roasted cauliflower, my 11 year old son loves this! Add more spices and herbs to suit your taste." Preheat the oven to 450 degrees F (220 degrees C). Grease a large casserole dish. Place the olive oil and garlic in a large resealable bag. Add cauliflower, and shake to mix. Pour into the prepared casserole dish, and season with salt and pepper to taste. Bake for 25 minutes, stirring halfway through. Top with Parmesan cheese and parsley, and broil for 3 to 5 minutes, until golden brown. This simple vegetable recipe is an elegant, healthy side dish. I used the suggestions of others and reduced the heat and covered the dish. I found that it was steamed cauliflower opposed to roasted. The flavour wasn't bad but it was fairly mushy. This was delicious. You can add as much garlic as you like. Roast it only until slightly soft. Don't let it become overcooked. Very good! Very yummy! I have used this for broccoli too.